Surround your opponent's Queen Bee using creatures that all move in unique ways, and you win. A modern classic that's great fun to play! Challenging with simple rules, no need for a board, so can be played just about anywhere. Includes both Mosquito and Ladybug expansion. I picked this up recently (a bargain from Spirit Games by the way) and also quite rare, so a real bonus! I was intrigued by most 2 player strategy games and thought this would be a good introduction to the 'abstract' genre. My wife and I used to enjoy playing Othello, so thought this would be worth a punt. Firstly the components are first class. The tiles are made from some sort of Bakelite material, which feels chunky and solid. 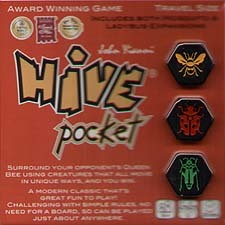 Board games are a very tactile medium, and Hive certainly scores top marks on this. They look fantastic on the table and so the game has great visual appeal. Thankfully this is backed up by fast, simple and addictive game play. You are trying to fully surround your opponents Queen Bee, using your pieces. Players have a variety of insect tiles that move in different ways, rather like Chess. The strategy is to try and keep the Queen protected to a degree, whilst putting your opponent in a difficult position with your pieces. the game plays quick, and as already mentioned, the game is extremely portable and can be played almost anywhere with a flat level surface the size of an A4 piece of paper. Along with Tides of Time, this has to be my favourite 'go to' travel strategy game.